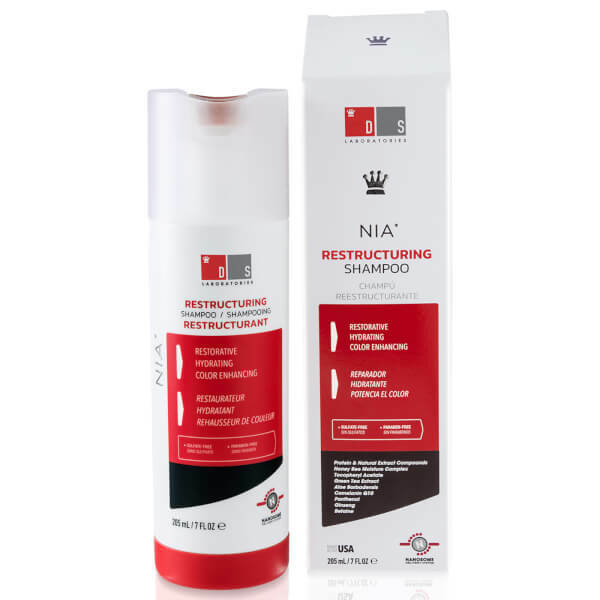 Treat damaged hair to the benefits of DS Laboratories Nia Shampoo; a restorative formula that works to hydrate, strengthen and repair from root to tip. Powered by Panthenol, Green Tea Extract and an innovative Honey Bee Moisture Complex, the restructuring shampoo effectively cleanses and rejuvenates hair, whilst targeting split ends and improving manageability for easier styling. The botanical-rich formula leaves locks feeling soft, smooth and healthy with a salon-worthy finish. Apply to wet hair, massage, then rinse.